Summer fashion trends must include light and flowing fabrics and the one trend I’ve noticed is the use of wild prints and funky colours. I’ve been wearing this trendy jumpsuit for a reason. It’s super comfortable, it’s light, flowing, and gosh, I honestly feel it is suitable for the hot weather. Summer fashion this year also includes the use of prints that are ranging from florals, checks, nautical stripes, loud motifs, and more. These are so trending right now! This is one of the reasons I’ve made this jumpsuit my pick for the summer fashion wardrobe. I’ve chosen to wear the red and blue Jumpsuit from Global Desi located at RMZ Galleria Mall, Yelahanka New Town. Global Desi has used the trend of prints but created their own version of it. This is what I love about this brand! The outfit is busy yet not overpowering with their clever use of colours. 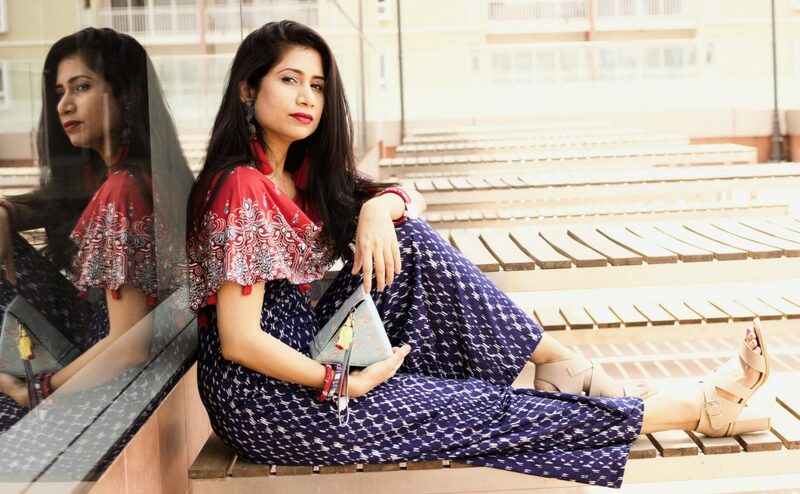 Global Desi stands out from it’s typically funky prints, use of colours, cut, and of course, amazing fabric that gently hugs the body without being too clingy. I personally love the play of colours so I’ve chosen to accessorise it with funky jewellery from Global Desi. I’ve also broken my own rules by pairing it with large statement earrings and light bangles that go along with the colour palette. I usually stick to one accessory but this time, I’ve added two. If you, however, want a toned down look, opt for accessories that are neutral in colour. You can also avoid a loud lipstick and go for a sun-kissed makeup with gloss on the lips. Pair with it comfortable flats in white and you are ready with your summer fashion wardrobe. Jumpsuits are suitable for a day-time look to a casual dinner out date or evening out with friends. You can style this versatile garment differently by combining with a light weight white jacket (like a structured blazer). For a different casual look, opt for a sling bag in contrast colours to store your essentials. The addition of heels is because the jumpsuit flares out gently and I love to combine slightly flared looks with heels. Summer Fashion is incomplete without strappy footwear and I’ve styled these from AND by Anita Dongre, RMZ Galleria Mall. The colour chosen is neutral due to the funky prints for this outfit. I have to add here that the heels are super comfortable and I did not feel any discomfort after walking around in them. The quality is great and they feel quite soft when you slip the foot in. Definitely an investment for your feet! I’ll be taking summer fashion towards a different look soon. Stay tuned to my blog and don’t forget to follow me on Twitter and Instagram. If you’re looking for the best in summer fashion trends and are in Bangalore, drop by to RMZ Galleria Mall, Yelahanka New Town.